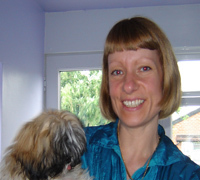 Hi, my name is Jane and I’m the owner of Woofcuts grooming, a small locally run grooming parlour in Brandlesholme, Bury. I have always wanted to work with animals so several months ago I decided that it was time to make the change and follow my dream of working with dogs. I had often groomed my own dogs over the years and enjoyed it, but wanted to learn how to do it to a professional standard so I enrolled on a Grooming course at the local college, and having completed that I then enrolled on an intensive course at Look North Training Centre in Keighley where I was trained by Zoë Duffy and Joanne Angus who both helped me obtained my City and Guilds / NPTC level 2 qualification in dog grooming. Woofcuts salon contains all the latest equipment to assist in making you dogs grooming experience as comfortable and safe as possible. 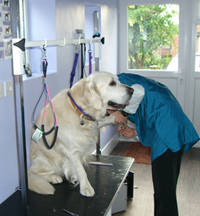 The salon is run from our converted garage and is a clean, safe environment for your dog. After each grooming session the salon is thoroughly cleaned, and all surfaces are disinfected. We only ever have one dog in the salon at any one time, which enables us to give your dog all the care and attention it deserves. As we only have one dog in the salon at anyone time we find this helps the dog relax more as there are no distractions. All dogs are fully insured whilst in our care, and we are happy to offer any advise regarding the Grooming of your dog.